A regular summer resident and migrant throughout the state; occasionally birds linger into the winter months at bird feeders. The Gray Catbird was an abundant species during the Minnesota Breeding Bird Atlas (MNBBA). Broadly distributed across southern Canada, the eastern United States, and the northern Great Plains, the Gray Catbird’s breeding range stretches west to eastern Washington and Oregon in the north and northern Arizona and New Mexico in the south. The core of the species’ breeding range is in the north-central and northeastern United States, from eastern Minnesota and Iowa east across the Great Lakes to the northern Appalachian Mountains (Figure 1). Assigned a Continental Concern Score of 8/20 by Partners in Flight. A short- to medium-distance migrant that winters in the southern United States and in Central America. A ground feeder and foliage gleaner that consumes both insects and fruit. An open-cup nest usually placed in shrubs. Breeding distribution and relative abundance of the Gray Catbird in North America based on the federal Breeding Bird Survey, 2011–2015 (Sauer et al. 2017). In the early 1900s, Roberts (1932) considered the Gray Catbird a common summer resident statewide, though most common in abundance south of the northern forests. It could be found “in all the wooded portions of the state, including the scattered native groves and timber-claims of the prairie regions.” Further north, “in the poplar groves and brush-lands of the northwestern counties, it is equally common up to the Canadian boundary.” Although it was “well represented” in the northern forest regions, it was not an abundant species. Nesting was confirmed or inferred in 7 counties: Goodhue, Hennepin, Itasca, Marshall, Polk, Rock, and Stearns. Little had changed 40 years later, when Green and Janssen (1975) published their updated account of the species. Although the Gray Catbird was still distributed across the state, they noted that in northern Minnesota it was largely confined to brushy openings in the region’s extensively forested landscape. A few years later, Janssen (1987) identified 37 counties where nesting had been documented since 1970. Hertzel and Janssen (1998) later added an additional 12 counties to the list. From the late 1980s through 2014, the Minnesota Biological Survey documented a total of 1,430 breeding season locations for the Gray Catbird. Observations were least numerous in the eastern half of the Laurentian Mixed Forest Province and in the intensively cultivated regions of the Red River valley and the upper Minnesota River valley (Minnesota Department of Natural Resources 2016). MNBBA participants reported 4,422 Gray Catbird records in 49.7% (2,361/4,752) of the surveyed atlas blocks and in 66.8% (1,562/2,337) of the priority blocks. Breeding evidence was confirmed in 368 blocks (Figures 2 and 3; Table 1). The species was observed in all 87 Minnesota counties and was confirmed breeding in 78 counties. Of these, 32 counties were additions to the list published by Hertzel and Janssen (1998). Least abundant from Koochiching County east across northern St. Louis County and throughout Lake and Cook Counties, the Gray Catbird was most abundant in the Eastern Broadleaf Forest Province and in the southern half of the Laurentian Mixed Forest Province. MNBBA data were used to generate a model predicting the relative abundance of the Gray Catbird across the state (Figure 4). The highest breeding densities were predicted in the river valleys of southeastern Minnesota, just north of the Twin Cities metropolitan region in the Anoka Sand Plain Subsection, and north along the prairie-forest border extending to the Tallgrass Aspen Parklands Province near the Canadian border. The Gray Catbird is predicted to be moderately abundant throughout the Prairie Parkland and Eastern Broadleaf Forest provinces and throughout much of the southern and western regions of the Laurentian Mixed Forest Province. Densities decrease moving east through the northern forests. One notable exception is the area of the Ham Lake fire, where more than 75,000 acres burned in 2007 at the northern end of the Gunflint Trail. Overall, the statewide distribution of the Gray Catbird has changed little in the past one hundred years. Across the state’s broad agricultural landscape, the primary breeding opportunities are provided by shelterbelts, woodlots, and riparian corridors. While the species remains least common in the northeastern region, suitable habitat created by residential development in the western and southern portions of the Laurentian Mixed Forest Province likely provides more habitat for the catbird than was available in the early 1900s. In their comprehensive review of the species, Smith and his colleagues noted that no significant changes have been documented in the Gray Catbird’s breeding distribution (Smith et al. 2011). Nonetheless, this shrub-loving species likely benefitted from the wide-scale clearing of the eastern deciduous forest in the 1800s and early 1900s (Cadman et al. 2007). Breeding distribution of the Gray Catbird in Minnesota based on the Breeding Bird Atlas (2009 – 2013). Summary statistics of observations by breeding status category for the Gray Catbird in Minnesota based on all blocks (each 5 km x 5 km) surveyed during the Breeding Bird Atlas (2009-2013). Summary statistics for the Gray Catbird observations by breeding status category for all blocks and priority blocks (each 5 km x 5 km) surveyed during the Minnesota Breeding Bird Atlas (2009-2013). Predicted breeding distribution (pairs per 40 hectares) of the Gray Catbird in Minnesota based on habitat, landscape context, and climate data gathered during the Minnesota Breeding Bird Atlas (2009-2013) using the General Linear Modeling method with an adjustment for detectability. The scientific name for the Gray Catbird’s genus, Dumetella, is a derivative of the Latin term dumetum and translates to “thicket,” an accurate description of the species’ dense and often tangled shrubby habitat (Terres 1980). The species is able to accommodate its preference for dense shrubs and tangled vines in a wide range of different habitats, from young deciduous forest stands, shrubby wetlands, riparian corridors, and forest clearings to fencerows, farm shelterbelts, power line corridors, and residential neighborhoods (Figure 5) (Kaufman 1996; Smith et al. 2011). Coniferous stands are usually avoided, but the species is strongly associated with highly fragmented landscapes (Keller and Yahner 2007; Robbins et al. 1989) and with high shrub densities wherever they occur (Lent 1990). The National Forest Bird (NFB) Monitoring Program, a long-term study of forest birds in the four national forests of northern Wisconsin and Minnesota, documented that the species was most strongly associated with small towns scattered across the densely forested landscapes. Within the forest, it was most closely associated with open, dry habitats that often characterized young clear-cuts and other forest openings (Niemi et al. 2016). MNBBA data illustrated the wide range of habitats where the species was found statewide. Within 200 m of point counts where the Gray Catbird was detected, the species’ strongest association was with upland oak stands, followed by wetland meadows and shrub wetlands (Figure 6). The strong association with oak forests results from the open canopy and dense shrub understory that is characteristic of many oak woodlands across the state as well as the fragmented landscape in which many of these stands are embedded in southern Minnesota. Typical breeding habitat of the Gray Catbird in Minnesota (© Lee A. Pfannmuller). Habitat profile for the Gray Catbird based on habitats within 200 m of point counts where the species was present during the Minnesota Breeding Bird Atlas (2009-2013). Data gathered by the federal Breeding Bird Survey (BBS) have generated a global population estimate of 29 million breeding adults (Rosenberg et al. 2016). In 2013, Minnesota was estimated to support 4.3% of the continental population (Partners in Flight Science Committee 2013). Applying that percentage to the current BBS continental population estimate generates a statewide estimate of 1.3 million birds. The statewide population estimate derived from the more intensive MNBBA point counts is significantly larger at 3.2 million adults (95% confidence interval of 3.0 to 3.7 million adults). Although Minnesota supports a large number of breeding catbirds, breeding densities are actually higher further east, across the Great Lakes region and the northern Appalachian Mountains (Figure 1). Along BBS routes in Minnesota, observers detect an average of 4 birds per route each year. Further east, along the Atlantic Coast of southern New England and the mid-Atlantic states, approximately 25 birds are detected per BBS route; the state of Connecticut reports the highest breeding density with an average of nearly 37 birds per route (Sauer et al. 2017). At the local level, the number of breeding pairs also ranges widely, from as low as 4 pairs per 40 ha to as high as 280 pairs per 40 ha; an “exceptionally dense population” was reported in southern Manitoba that ranged from 396 pairs per 40 ha to 1,000 pairs per 40 ha over a three-year period (Smith et al. 2011). By contrast, in the Chippewa National Forest in northern Minnesota, the NFB program detected an average of 0.65 pairs per 40 ha from 1995 through 2010; on the more densely forested Superior National Forest, an average of only 0.04 pairs per 40 ha were detected (Niemi et al. 2016). Nationally, the Gray Catbird has demonstrated a relatively stable population throughout its breeding range since 1966 (Sauer et al. 2017). In Minnesota, the trend has been remarkably similar (Figure 7). In northern Minnesota, however, the NFB Monitoring Program revealed a nonsignificant declining trend in the Chippewa National Forest (Figure 8). The species was too uncommon in the Superior National Forest to conduct a trend analysis. Despite its overall stable population trend, regional increases, especially in the northwestern United States and southwestern Canada, have been offset by declines in the northeastern United States, the Maritime Provinces, and large areas of the southeastern United States (Figure 9). The declines in the Northeast may be due in part to forest succession on abandoned farmsteads that formerly provided more of the open, shrubby habitat preferred by the species. 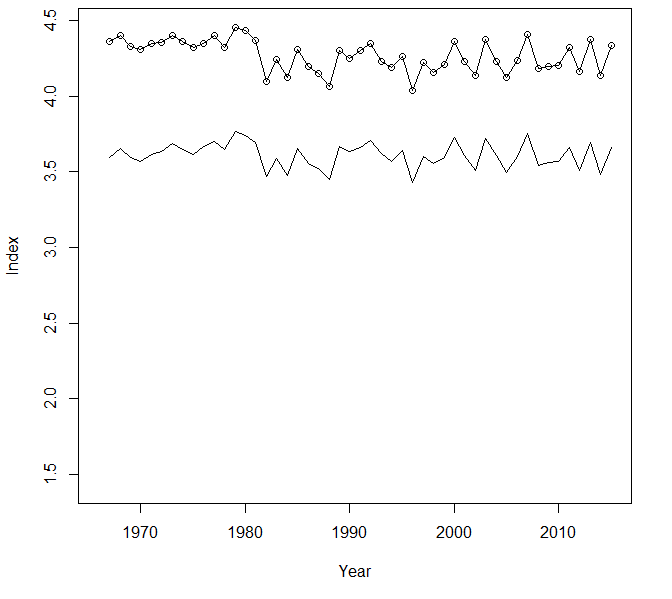 Breeding population trend for the Gray Catbird in Minnesota for 1967–2015 based on the federal Breeding Bird Survey (Sauer et al. 2017). 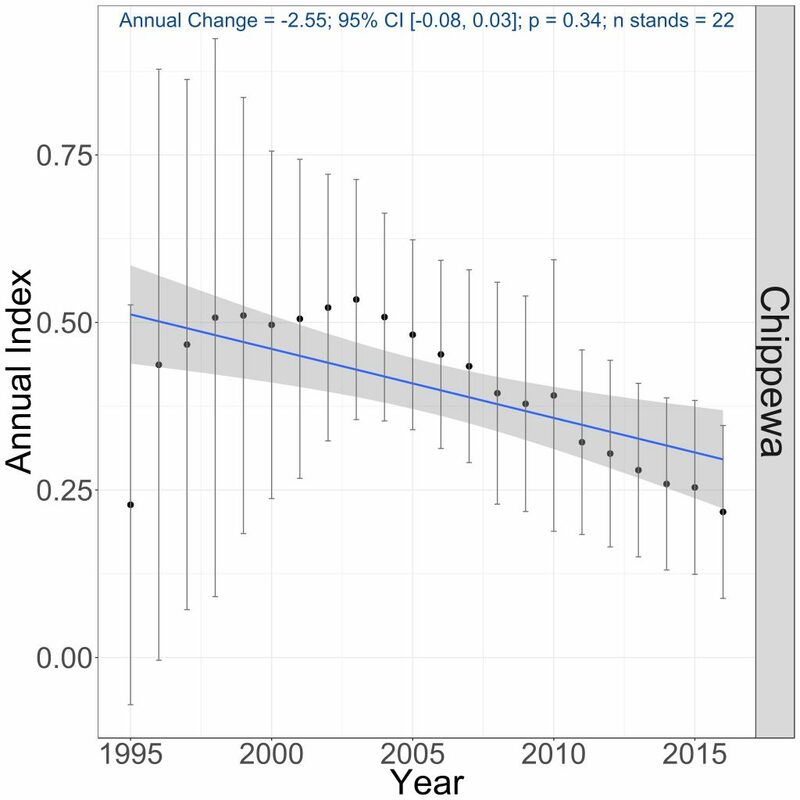 Breeding population trend of the Gray Catbird in the Chippewa National Forest, 1995–2016 (Bednar et al. 2016). Population trend map for the Gray Catbird in North America for 1966–2015 based on the federal Breeding Bird Survey (Sauer et al. 2017). With a wide distribution and a large, stable population, the adaptable Gray Catbird is not a conservation priority at either the state or federal level. Indeed, the species has fared well in the face of increasing urbanization and development. Even within densely forested landscapes, timber management activities create favorable habitat opportunities. In light of these considerations, Partners in Flight has assigned the species a Continental Concern Score of 8/20 (Rosenberg et al. 2016). Although intensive agricultural practices and dense urbanization would likely decrease the availability of shrubby habitats, the distribution and abundance of the Gray Catbird in Minnesota does not appear to be impacted by such changes to date. Indeed, the species was well distributed throughout some of the most intensively cultivated regions of western Minnesota and was most abundant in the highly urbanized region from southeastern Minnesota north through the Twin Cities, Brainerd, and Duluth. Even warming temperatures, which are predicted to negatively impact many members of Minnesota’s avifauna, are not considered a major concern for the species, whose overall vulnerability has been rated as low (North American Bird Conservation Initiative 2010). One of the most frequently observed species during the Minnesota Breeding Bird Atlas, ranking 23 out of 249 reported species, the Gray Catbird is likely to remain an abundant breeding species in Minnesota for many years to come. Keller, Gregory S., and Richard H. Yahner. 2007. “Seasonal Forest-Patch use by Birds in Fragmented Landscapes of South-Central Pennsylvania.” Wilson Journal of Ornithology 119: 410–418. Lent, Richard A. 1990. “Relationships Among Environmental Factors, Phenotypic Characteristics, and Fitness Components in the Gray Catbird (Dumetella carolinensis).” Phd diss., State University of New York at Stony Brook. Terres, John K. 1980. The Audubon Society Encyclopedia of North American Birds. New York: Alfred A. Knopf.